The world’s central banks are having a hard time of it these days, having just gotten through the worst banking and financial crisis in living memory they now face a growing dilema between continuing to give support to the developed economies (which are yet to recover from those early hammer blows) and the danger of creating fresh global asset price bubbles in emerging economies, asset bubbles which could easily be being fuelled by low US interest rates and a weak dollar. The latest warning in this respect comes not from Nouriel Roubini (or even from me, but see this post, and this recent interview I gave on Forex Blog), rather it emmanates from Germanyâ€™s new finance minister, Wolfgang SchÃ¤uble. His comments – which were cited in last Saturday’s Financial Times – highlight official concern in Europe that the exceptional steps taken by central banks and governments to combat the crisis carry with them a series of undesireable side effects. Such openly expressed concerns only add further weight to recent statements made in China, where only a week ago the banking regulator Liu Mingkao explicitly criticised the US Federal Reserve for indirectly fuelling the â€œdollar carry-tradeâ€ â€“ a process whereby investors borrow dollars at ultra-low interest rates in the United States and the invest them in higher-yielding assets abroad. However, regardless of whether or not we are running the danger of having an overly rapid unwind effect, untold damage is in fact being done, with the structural distortions being produced by the massive â€œwall of liquidityâ€ which is currently sweeping the planet being evident enough, showing up as it is in some unexpected places, like Russia for example. On the face of it the idea that investors who were rushing for the Russian door following the Roki tunnel incursion back in August 2008 may now be rushing back in again may seem hard to believe, particularly given the serious economic recession which followed, and in reality it isnâ€™t quite like this, but what is clear is that a steady and significant flow of funds is now most definitely heading in Russiaâ€™s direction – even if the immediate objective is not to increase what Russia most definitely needs, namely capital investment. A brief glance at the charts for movements in the ruble vis a vis the US dollar (see below) shows immediately what has been happening. After hitting a low of $31.39 on September 2 the ruble has been steadily rising, and was at $28.65 on November 11, since which time it has been hovering, as investors vacilate waiting to see where policy and the currency go from here. In fact, as I say, while it is clear that Russia is on the receiving end of a steady inflow of funds, it is far from clear that these funds are of the kind she most needs at this point. Much of the money has been going into stocks, and Russian equity funds drew record amounts at the end of October, according to data provided by EPFR Global. In fact Bloomberg data show that the ruble has been the second-best performer among emerging market currencies after the Chilean peso over the past three months, gaining 8.7 percent in the period. And even foreign currency purchases from the central bank and lowering interest rates systematically to a record low (in Russian terms) has not worked. Indeed Russia’s foreign currency reserves have now risen to $441.7 billion (as of Nov. 13) compared with the low of $376.1 billion reached on March 13. Whilethe Micex Stock Index has gained 116 percent this year, making the Index the best-performing benchmark equity measure globally since January (in local currency terms), again according to Bloomberg data. In comparison Russiaâ€™s foreign direct investment plummeted an annual by 48.1 percent, the most on record, to just $10 billion in the first nine months of the year, while overall foreign investment, including credits and flows into securities markets, was $54.7 billion, down 27.8 percent when compared with the same period a year earlier,according to Federal Statistics Service data. Other foreign investments, including loans from foreign banks and Russian companiesâ€™ foreign divisions, were down 20.9 percent in the period to $43.7 billion. 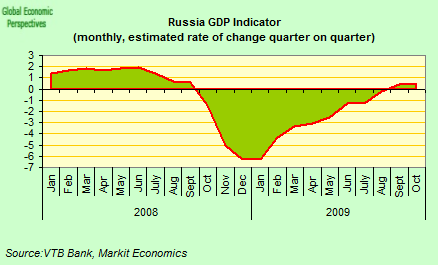 The consequence of all this is that the decline in investment activity has been – as can be seen in the GDP growth components chart below – perhaps the greatest single drag on the domestic Russian economy over the past twelve months. The problem has recently become even more complicated since, in the short term at least, letting the rouble rise also has its attractions for a Russian administration faced with simmering popular frustration with their inability to get the ongoing economic contraction fully under control. A rising ruble means slower inflation and more spending power for domestic consumers, consumers who have yet to get over the record 10.9 percent economic contraction which hit them in the second quarter. 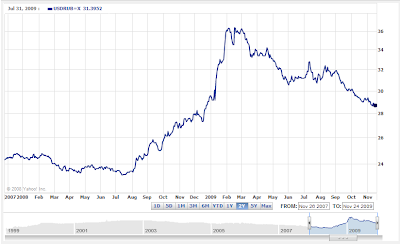 Given that the nine interest rate cuts introduced by the central bank since April have manifestly failed to unlock the credit flow to consumers as banks hold back their lending on concern borrowers canâ€™t repay their debt (see chart below) a rising exchange rate certainly seems to be worth a second look as a way forward, since while a higher exchange rate coupled with near double digit inflation may cripple manufacturing competitiveness, it does transfer incomes directly into peopleâ€™s pockets, something hard pressed politicians might see as quite beneficial. 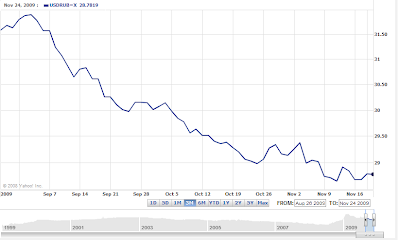 Lending is still – as can be seen in the above chart prepared by the World Bank for its latest report – a problem, and corporate (or non-financial corporation lending) fell by 0.7 percent in September from August continuing the ongoing decline. Lending to households dropped 1.1 percent making the eighth consecutive monthly decline, with year on year levels now in negative territory, while non performing retail loans rose, climbing to 6.4 percent from 6.2 percent. And the World Bank expect the many bank balance sheets will continue deteriorating as the share of non-performing loans increases. â€œIn the environment of increasing credit risks, lending activities by the banks have remained limited despite improving liquidity conditions in the economy and continuing monetary loosening.â€ Bad debts in the banking industry may reach an average of 10 percent by the end of the year according to the Bank. 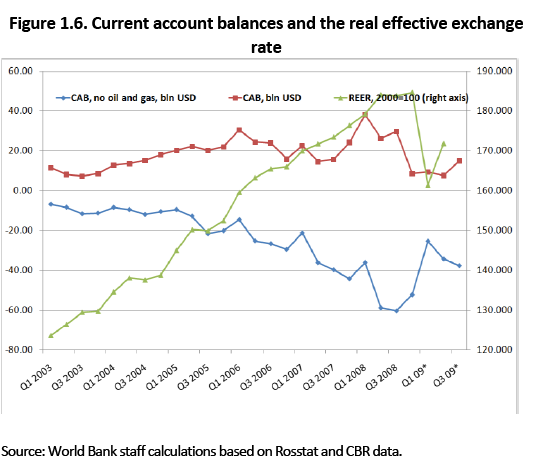 And when we look at ruble realities, as the IMF point out, efforts to stem the ongoing rise with intervention are far from being able to give the desired result. Bank Rossii bought a net $15.2 billion and 485 million euros in October, their largest foreign currency purchases since May, and went on to buy $6 billion during the first 17 days of November according to press reports citing central bank chairman, Sergey Ignatiev. Yet last week the Russian the ruble ended 0.1 percent higher at 35.0632 against the central bankâ€™s target currency basket, its strongest level since December 23 2008. The ruble appreciated 3.4 percent in October against the dollar (for its second consecutive monthly gain) and has risen more than 1 percent so far in November. Thus the central bank has now moved on to use monetary policy to try and stem the rise, and said on October 29 that it would also use interest rates in an attempt to reduce the â€œattractiveness of short-term investments in Russian assets and stop the accumulation of riskâ€. The recent rise follows ruble a 35 percent slump against the dollar between August last year and January, raising the cost of imports (which make up about 49 percent of the consumer goods sold in Russia) and, in theory, making Russia’s domestic industry somewhat more competitive externally. However, without a sound institutional infrastructure, and a coherent monetary policy, short term devaluation gains can easily be turned into medium term inflation, thus defeating the purpose of corrective price devaluation. 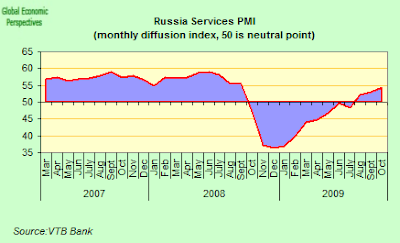 The current problems are not of recent making, but are the logical end product of steady and systematic long term mismanagement of Russia’s monetary policy, a mismanagement which has now created a veritable Procrustean bed of problems for both Russia’s economy and the wider society. Warnings were frequent enough, but went unheaded, and the continuing failure to address the underlying inflation problem between 2005 and 2008 now means that large structural distrortions have been accumulated in the economy, including a massive one of commodity export dependence, a problem which effectively turned the country into a veritable disaster waiting to happen if ever there should be a protracted lull in the secular rise in energy prices. That lull has most definitely now arrived, since while it is obvious that Russia’s short term future depends on energy prices, it is far from clear what the future holds for those energy prices themselves. Following the deep output drop sustained in the first half of the year (10.4% of GDP year on year), the slow recovery in global demand and rise in commodity prices has helped lift Russiaâ€™s economy up from its earlier lows. But the recovery has only been a modest one, since preliminary data indicate that the economy still registered a 9.4 percent year-on-year drop in the thrid quarter, indicating only a very small improvement (possibly a seasonally adjusted 0.6%) over the second quarter. More recent data also point towards a rather uneven progression, with the manufacturing sector falling back while rising real incomes means that consumer demand is producing stronger growth in the services sector. Six million Russians were added to the governmentâ€™s official poverty count in the first quarter of this year alone, and by the end of 2009, 17.4 percent of the population or 24.6 million people will be living beneath the subsistence level of $185 per month, almost 5 percent more than before crisis, according to World Bank estimates. Unicredit analysts forecast that the number of Russians with disposable incomes of more than $1,000 per month will fall 48 percent this year to about 13.6 million, or roughly 9.6 percent of the population. 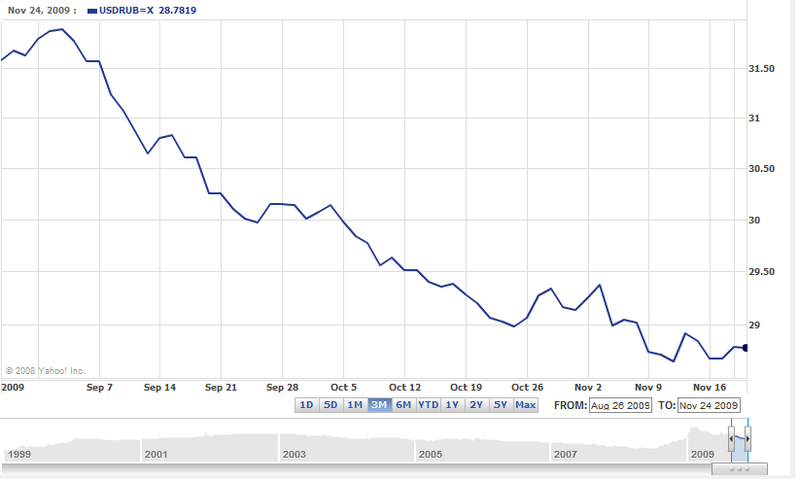 Thus this recession is likely to have lasting and important results. And while it is entirely possible that the economy will show a â€œmodestâ€ recovery in the second half of 2009, this is â€œunlikely to have significant impact on social indicators,â€ according to the World Bank. Unemployment will increase to 9 percent â€œas seasonal factors waneâ€ from 7.6 percent in September and it may take three years before the number of Russians living in poverty falls to pre-crisis levels, the World Bank estimates. Indeed, in the short term real incomes are â€œlikely to fall further”. The political threat posed by growing unemployment and rising poverty must most certainly be one of the reasons behind Russiaâ€™s central bank recent decision to lowered its key interest rates for the eighth time in six months, in a bid to both stimulate lending and to stem the inflow of funds and the rise in the value of the ruble which is making the work of restoring competitiveness to the manufactured sector all the more difficult. 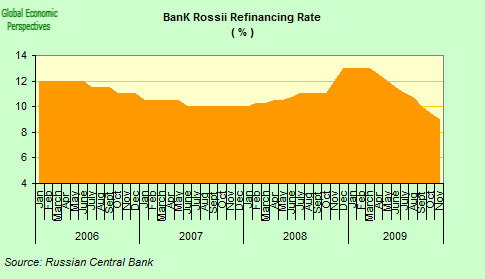 Earlier this month Bank Rossii cut the refinancing rate to 9 percent from 9.5 percent and reduced the repurchase rate charged on central bank loans to 8 percent from 8.5 percent. Despite the reductions Russia still has the fourth-highest benchmark interest rate in Europe after Ukraine, Iceland and Serbia. The bank is caught on the horns of a large dilema, since cutting rates further to stem inflows and the ruble rise may only risk fuelling more inflation, yet First Deputy Central Bank Chairman Alexei Ulyukayev stressed only this week (following the latest in rate decision) that the central bank did not exclude the possibility of further cutting its rates since it sees â€œno inflationary risksâ€ next year and an inflation rate â€œmuch lowerâ€ than 9 percent. This follows explicit remarks at the end of October that the Bank was ready and willing to use interest rate policy as required to stem speculative capital flows that “threaten to undermine currency stability”. One small consolation at least in this ongoing mess is that pressure on Russiaâ€™s producer prices have been easing, and factory gate prices have even been falling. According to the preliminary data from the State Statistics Service, the price of goods leaving factories and mines was in fact down an annual 10.8 percent in August following a record 12.3 percent drop in July. 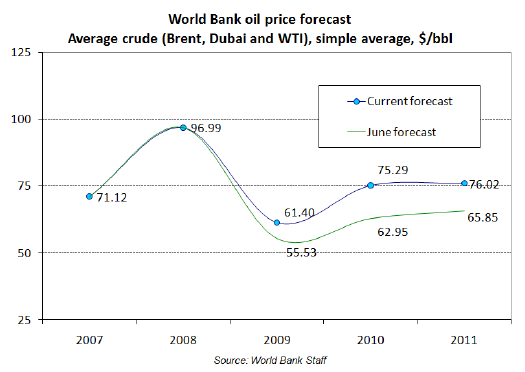 Evidently The with the 2008 spike in oil and energy prices the logic behind this is easy to see. What is not so easy to see is why domestic prices take so long in responding to general capacity utilisation signals and why the Economic Development Ministry still seems comfortable with the expectation that average inflation will range between 12 percent and 12.5 percent in 2009 only marginally down from last yearâ€™s 13.3 percent. Stunning! And while consumer price inflation has been tame in recent months this good behaviour may not last long, since it could rise more than expected in November, according to Deputy Economic Minister Andrei Klepach, who does not seem to completely share Alexei Ulyukayev price optimism. Consumer prices could rise “by about 0.3% to 0.4%” in November, Klepach said in comments recently, and this prediction seems to be near the mark, since according to the latest data we have consumer prices rose 0.1% in the week to 9 November, bringing to an end a period of just over three months without inflation. Looking into the future price growth may be further spurred by an influx of budget spending in the fourth quarter, as well as by a planned 30% increase in pensions which is due to come into effect on 1 December. 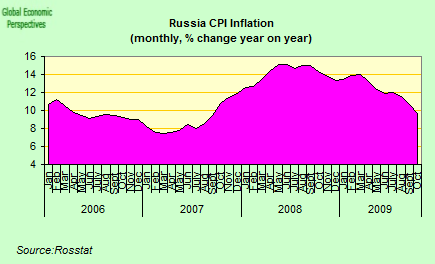 In fact, despite the fact that inflationary pressures have been easing in Russia in recent months, chiefly due to collapsing consumer demand and outlfows of capital following the crisis that hit the country a year ago, the official outlook for Russia’s inflation in January 2010 is only that it will be “significantly below “the level of January 2009. This kind of argument is hardly reasssuring, since inflation last January was at an annual rate of 13.4%, although the short term outlook is for only a mild acceleration, with consumer prices increasing by between 0.2% and 0.3% in November and by about the same amount in December. Well, one way not to solve the problem, according to European Bank for Reconstruction and Development Chief Economist Erik Berglof, would be a ruble devaluation, since despite recognising that the country has a very difficult couple of years in front of it, Berglof argued recently that â€œthis (devaluation) is the wrong way to think about the recovery in Russiaâ€. Well, this is exactly the point, and is why I have been arguing over the last two year about how all those wage increases which the Russian administration seemed to rejoice in (since they bought short term popularity, and fuelled consumption) simply stoked-up the domestic inflation bonfire and in the process did untold damage to domestic competitiveness. However it is evident Russia’s industries cannot now simply be transformed overnight, and this is where I find a weakness in Berglofs argument, since some remedy is needed to straighten out the distortions and get of commodity export dependence. But what? If it isn’t devaluation, then surely we will need to see very substantial wage deflation in order to attract the now much needed inward foreign investment. The current position whereby prices rise by an annual 10%, and living standards are maintained by a sharp rise in the value of the ruble (making imports cheaper) is quite simply unsustainable, for reasons which should be evident from looking at the chart below. 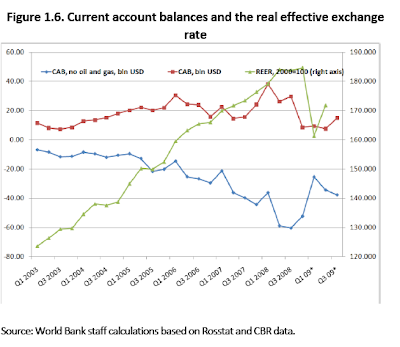 If you look at the green line (which shows the Real trade weighted Effective Exchange Rate) we will see how this has risen sharply since 2003, with the exception of the drop in the value of the ruble in the second half of last year. If we then look at the blue line (which shows the non oil and gas current account balance) we will see how this has been steadily deteriorating (again with the exception of the short sharp shock occassioned by the crisis of last autumn). 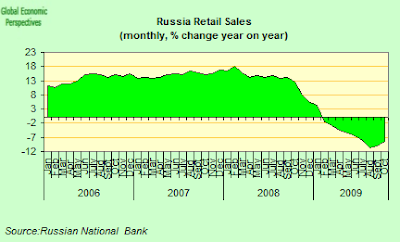 However, as we can also see, the green (REER) line has now once more resumed its upwards march – the consequence of all those financial inflows, and the associated rise in the ruble – and with the upward march comes the ongoing structural damage to the economy, precisely the can’t of structural damage which Erik Berglof would like to avoid, and even unwind. Of course not everyone agrees with Berglof, and the Russian Association of Regional Banks, whose 450 members include the Russian units of Barclays and Citigroup, has called for a devaluation of as much as 30 percent. Billionaire Vladimir Potanin, realist and owner of 25 percent of OAO GMK Norilsk Nickel, said in recent interview with the Russian Newspaper Vedomosti that the â€œinterests of the economyâ€ will lead the currency to depreciate in the â€œmid term,â€ allowing exporters to cut costs and modernize production. Nonetheless energy, including oil and natural gas, accounted for 69.1 percent of exports to countries outside the former Soviet Union and the Baltic states during the first seven months of this year, according to the Federal Customs Service, while metals were responsible for another 12%. So the commodities dependency is massive, and this situation can’t be turned round easily. 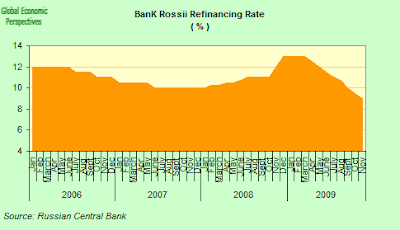 Bank Rossi are also not 100% convinced by the merits of Berglof’s reasoning, as witnessed by the fact that they facilitated a 35 percent depreciation in the ruble during the second half of last year (see chart below), and as the collapse in raw material prices and the dramatic change in local credit conditions first pushed Russia’s economy into recession the rubleâ€™s trading range was widened to between 26 and 41 against the dollar-euro basket. However, as I keep stressing, the central bank is now locked on the horns of a massive dilemma, since as risk appetite returns, with it comes the enthusiasm for buying the so called “high yield” currencies – like the South African Rand, the Russian ruble and the Hungarian forint. Instruments denominated in all these currencies offer investors substantial returns at the present time thanks to offering some of the highest interest rates among globally traded currencies. In general, engaging in one or other form of the thousand-and-one-varieties carry trade is pretty standard practice during times when returns for real economic activity are low, and central banks hold down rates and supply liquidity. Indeed we may include here the kind of carry practiced by banks in borrowing from the central banks only to then lend – for a small, but very low risk, interest rate commission – to their national government, who at this stage in the business cycle will normally be running a fiscal deficit. So more than funding recovery, the watchword at the moment is very much “carry on carrying”. But for those on the receiving end, the consequences of so much carry are far from innocuous, since the process simply funds all sorts of economic distortions, and far from allowing normal market corrections to occur, it simply amplifies the problem. Things are now becoming very detached from the so called “fundamentals” (whatever those might be in the topsy turvy world in which we now live), since it simply is not plausible that the currency should be rising in this way in a country with nine percent plus consumer price inflation and which badly needs to move away from commodity export dependency. The only conclusion which could be drawn is that the Russian economy now needs massive structural reforms, and on any imaginable scenario in the world in which I live these are simply not going to be implemented. The Ministry of Finance baseline federal budget estimates with conservative oil assumptions icorporate plans to reduce the federal budget deficit from 8.3 percent of GDP in 2009 to 3 percent in 2012, but the medium term fiscal outlook also indicates an extensive drawdown of Russia’s Reserve Fund to finance the deficit. Given the size of the anticipated deficit, the Reserve Fund is likely to be depleted by the end of 2010 and borrowing will be required to offset the gap. Estimates of the Ministry of Finance indicate that the combined external and internal borrowing to cover the fiscal deficit will amount to 1.0 percent of GDP in 2009, 1.6 percent in 2010, 2.5 percent in 2011, and 1.5 percent in 2012. 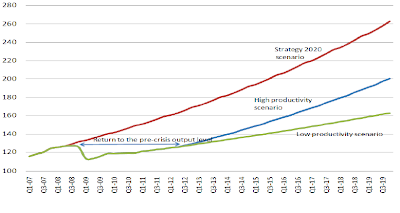 All of this is manageble, but the depletion of the Reserve Fund does mean that if downside risks materialise, and in particular if there are more writedowns in the banking sector needing government support that there is now little in the way of a cushion between managed adjustement and unstable dynamics. 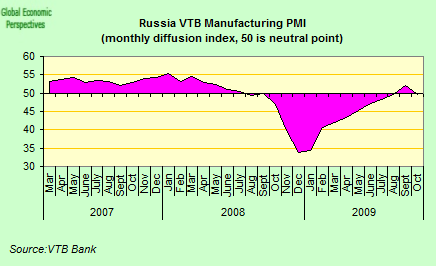 If one thing is clear hear it is that attaining a recovery in Russia’s economic fortunes at this point is going to be no easy feat, as Trust Investment Bank put it in their latest report, October data for the worldâ€™s largest energy exporter suggest â€œan almost complete absence of clear signs of recoveryâ€ since industrial output slumped and capital investment fell. October capital investment was still down 17.9 percent while industrial output dropped an annual 11.2 percent in October worse than the September reading. Even unemplyment was up again, at 7.7%, although as the World Bank pointed out, this is the result of the same seasonal factors which lead to the fall in unemployment over the summer. â€œâ€œThe GDP Indicator continued to point to an improvement in economic activity in October. The manufacturing sectorâ€™s performance deteriorated slightly while activity in the services sector is approaching pre-crisis levels. This might be one of the consequences of higher oil prices and a stronger rouble as low export orders were the main drag on manufacturing. Another encouraging development highlighted by the October surveys was the deceleration in the pace of job cuts: the employment sub-indices now stand at around 47, which is already higher than last autumn. In contrast the rebound in Russian services activity rose continued in October, supported by a record fall in charges, and Russia’s services sector, which accounts for about 40 percent of the economy, rose for the third consecutive month, reaching its highest level since September 2008, although the reading of 54.3 still remained significantly below the long-run series average. In contrast to the most recent PMI data and the opinions of analysts like Neil Shearing at Capital Economics and Trust Investment Bank , Russia’s political leaders are markedly more optimistic. Russiaâ€™s economy may expand as much as 4 percent in the last quarter of 2009 following a timid return to growth in the third quarter, according to Deputy Economy Minister Andrei Klepach speaking at a conference in Moscow recently. The economy may show â€œquite strong growthâ€ of between 3 percent and 4 percent in the fourth quarter over the previous three months, Klepach said. This is an interesting claim, and doubly so given that Klepach has been quite cautious so far this year in his claims. However, as Neil Shearing at Capital Economics points out Klepachâ€™s claim that growth could rise to an annual 4% at some point is perhaps not as wild as it first sounds. 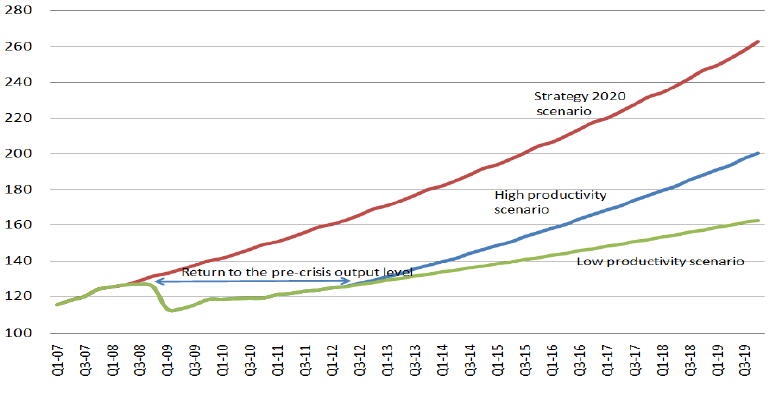 Shearing estimates that output fell by over 9% between Q4 2008 and Q1 2009, which means that given the sizeable base effects which will exist the Q1 2010 year on year growth rate might well look look quite impressive. 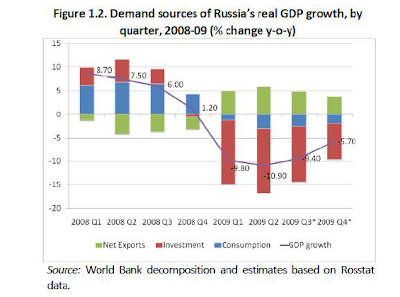 But this may be a kind of “mirage effect” since if the global recovery slows towards mid-2010 (and with it the level of energy prices) then Russian annual growth could easily fall back sharply over the second half of next year and into 2011. Thus the prospect of a renewed fall in energy prices would imply that the risk a double-dip recession in Russia is quite a real one. But this is all for the future, while here in the present the rising price of oil and the return of some financial flows into Russia continues to fire-up optimism, as do the numbers for retail sales, so we had better just grit our teeth and hope they don’t also fire up the inflation process again, although with lending to households still stuck in gridlock, perhaps the dangers here should not be overstated. More worryingly, inflation may fail to fall significantly from its current high level, even as the central bank reduces interest rates in a bid to stem the ruble rise. 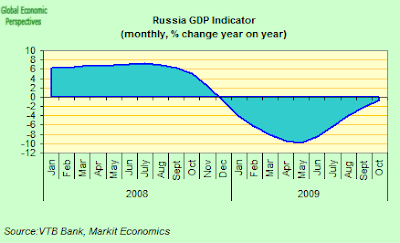 Klepach’s optimism is not shared, however, by the World Bank who in their latest report argue Russiaâ€™s economy will suffer a deeper contraction than they previously estimated this year even after a series of central bank interest rate cuts which have manifestly failed to ease the â€œprolongedâ€ credit drought. The World Bank now expect the Russian economy to contract by 8.7 percent this year, compared with their June forecast for a 7.9 percent decline. The government is currently predicting the economy will shrink 8.5 percent this year and grow 1.6 percent next year. The OECD, on the other hand, seems rather more positive, arguing that Russiaâ€™s economy will enjoy a stronger commodity-driven rebound than first estimated, although, they hasten to add, authorities should avoid a sudden removal of stimulus measures to ensure the domestic economy keeps up the pace of its advance. 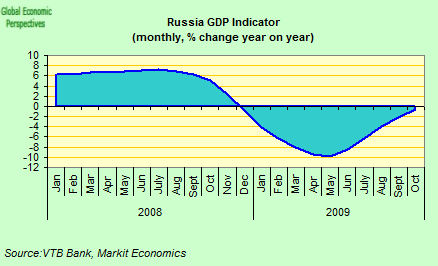 They now expect the Russian economy to expand by 4.9 percent in 2010, compared with a June forecast for 3.7 percent growth, although output is still expected to contract 8.7 percent this year (broadly in line with the World Bank), more than the 6.8 percent estimated in June. The 2010 figure seems very optimistic in the light of the problems here identified, and more than adding to our appreciation of the Russian situation such numbers may rather cast doubt on the methodology being applied, and raise questions about some of the numbers being seen for other countries. 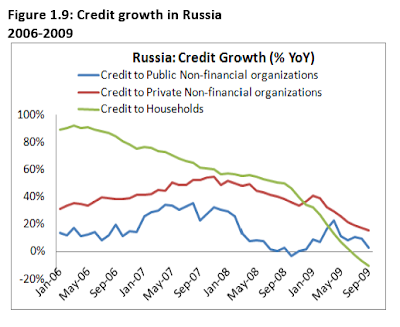 Russiaâ€™s pre-crisis decade of prosperity was built on strong capital inflows, rising consumer and corporate credit, and significant capital investment. The post-crisis world will look very different: Russia will need to implement fiscal adjustment and diversify its economy in the context of sluggish global growth, low capital flows, and more limited access to foreign financing. So it is now time to look towards a new growth model based on increases in productivity and know-how and on more efficient allocation and use of investment, labor, and FDI. Next generation reforms should be geared to make Russia’s monetary policy instruments much more effective, the Russian economy much more productive, diversified, and openâ€”and more able to respond to future shocks. The success and duration of the transition from the current model of heavy dependence of natural resources to a more sustainable growth model depends, according to the World Bank on maintaining a competitive exchange rate, sustaining a prudent fiscal stance, improving the investment climate, more mobile capital and labor, making the financial sector deeper and more efficient, investing in infrastructure to eliminate key bottlenecks to growth, and strengthening governance and fighting corruption as part of the overall effort to improve the effectiveness of the public sector. The OECD more or less agrees: â€œLaying the foundations for sustained rapid growth will require unwinding some of the distortive consequences of the crisis”. And, may I add, unwinding some of the distortive processes which lead the crisis to be such a severe one in the first place might not be such a bad idea either. 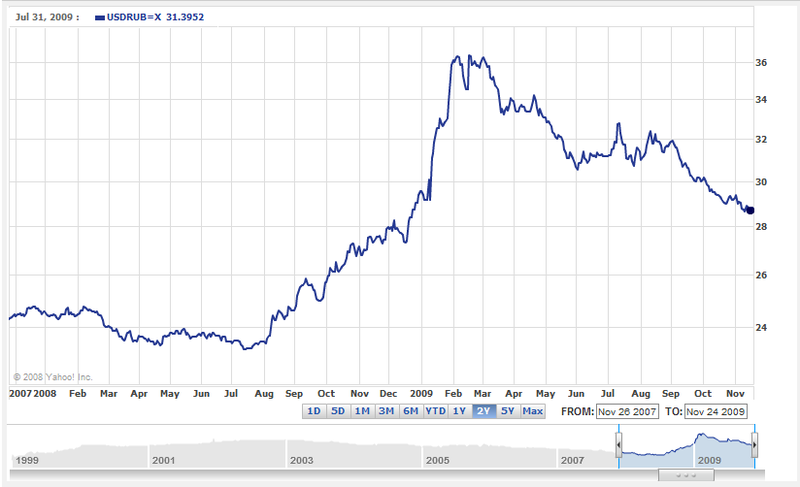 Strange increasing for Ruble against U.S. Dollar from $31.39 on September to $28.65 on November, taking in consideration the fact that we are talking about a period of just two months. But it seems to be good news from Russia I guess, interesting details here in the post.